Edgar C. Stroud grows his collard greens in buckets since the E.P.A. warned him about PCB's in his garden two years ago. The site in Anniston, Ala., is three blocks from a Monsanto plant that produced the chemical. 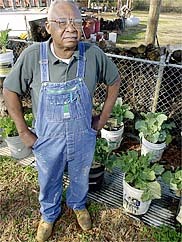 ANNISTON, Ala., Jan. 25  These days, Edgar C. Stroud grows his collard greens in five-gallon buckets filled with soil bought from Wal- Mart. He has done so ever since the man from the Environmental Protection Agency tested the dirt in his garden two years ago.
" `Do you eat stuff out of this garden?' " Mr. Stroud said the man asked, somewhat ominously.
" `Well, I wouldn't,' " Mr. Stroud said the man advised. As is the case across west Anniston, Mr. Stroud's garden is laced with high levels of polychlorinated biphenyls, or PCB's, presumably from the plant three blocks away where the Monsanto Company produced the suspected carcinogen for nearly four decades. During those years, St. Louis- based Monsanto flushed tens of thousands of pounds of PCB's and other toxic wastes into Snow Creek each year, sending the chemicals meandering through long-established neighborhoods and into Choccolocco Creek. More than 45 tons of PCB's, a highly efficient industrial insulator, were discharged in 1969 alone, according to company documents. Monsanto also deposited millions of pounds of PCB's in a hillside landfill just above the plant. Thirty miles away, in Gadsden, Ala., a jury is hearing a lawsuit filed by Mr. Stroud and more than 3,500 other plaintiffs who contend that Monsanto and its chemical division, Solutia Inc., should compensate them for reduced property values, emotional distress and, in some cases, health problems related to the PCB contamination. It is one of at least four major Anniston-related lawsuits against Monsanto and Solutia that have been filed by a total of 25,000 plaintiffs. Two of the cases have already been settled, for a combined $80 million. Because of the difficulty of seating an unbiased jury in Anniston, Judge Joel Laird Jr. of state Circuit Court moved the trial to Gadsden. In the first two weeks of testimony, the plaintiffs' lawyers have established through Monsanto memorandums that the company was aware of the level of its discharges and that it at least partly understood the risks as early as the mid-1960's, if not earlier. But it did not begin improving pollution controls until 1970, a year before it stopped making PCB's in Anniston. The company continued to produce PCB's elsewhere until 1977, two years before the federal government banned them. A witness for the plaintiffs testified on Thursday that PCB levels in the blood of many plaintiffs was elevated. The 16 plaintiffs in the first phase of the trial had average PCB levels of 46 parts per billion, 27 times the national norm, said Dr. Ian Nisbet, a Massachusetts toxicologist and a consultant for the plaintiffs. "This is by far the most contaminated community  as indicated by the levels in their blood  that I've ever encountered," Dr. Nisbet said. Because science remains murky on the health effects of PCB's on humans, those plaintiffs who maintain they have been personally injured by Monsanto may have difficulty proving their cases. But Anniston is rife with anecdotes about high and persistent cancer rates, particularly about children who developed tumors after frolicking in and around Snow Creek. David B. Baker, the president of Community Against Pollution, a local health and environmental group, said that his brother died at 17 of brain and lung cancer after growing up near the Monsanto plant. "It seems like everybody in these neighborhoods has cancer," said Mr. Baker, while driving through streets where contaminated houses have been bought and leveled by Monsanto and replaced by chain-link fences bearing "Danger" signs. The trial, he said, has given the community hope. To illustrate the health risks of PCB's, lawyers for the plaintiffs have relied on Monsanto's own memorandums, many of them marked "Confidential  Read and Destroy." A 1966 letter by a Mississippi State University scientist who was hired by the company to test creek water disclosed that 25 fish, when submerged in Snow Creek, "lost equilibrium and turned on their sides in 10 seconds and all were dead in three and a half minutes." A 1970 report revealed that a blacktail shiner caught in Choccolocco Creek was found to have 37,000 parts per million of PCB's in its fat, making it "the most contaminated fish I've ever heard of in the wild," Dr. Nisbet said. Lawyers for Monsanto and Solutia said they could not discuss the case because of an order imposed by Judge Laird. But in the past, they have maintained that the companies acted fairly in dealing with the city, that they spent more than $40 million on environmental testing and cleanup and that PCB contamination cannot be definitively linked to long- term health problems. "We would all rather live in a pristine world," said Jere White, a lawyer for Monsanto and Solutia, in his opening argument two weeks ago. "We are all going to be exposed to things on a daily basis. Our bodies can deal with it." For decades, many in Anniston had no idea that their neighborhoods were polluted or that their health could be at risk. But now, thanks to the lawsuits, the intervention of the federal government and the work of community groups, this city of almost 25,000 people seems to be defined by its environmental burdens. In addition to the PCB problem, there are new concerns about mercury releases from the Monsanto plant and the Army's plans to incinerate toxic gases at its depot here. "We're infamous," Mayor Hoyt W. Howell Jr. said. "The accumulation of the issues of the past have all come to a head at one time, and that's hard to handle." Mr. Howell said it was hard to pinpoint the effect of Anniston's environmental problems on economic development efforts, but said it was clearly one factor that has stymied the city. "We're between Atlanta and Birmingham on I-20," he noted, "and the prosperity of the 1990's was barely felt here."